Mexico’s economy is highly exposed to developments in the US. High uncertainty surrounding NAFTA renegotiations and other US policy directions in international trade, and specifically targeting Mexico, could adversely affect sentiment and investment. Peso movements have reflected these vulnerabilities and have already driven payment delays. Peso depreciation in 2016 has helped some exporters, particularly boosting the tourism sector. This stimulus has subsided as the peso has recovered some lost ground. The domestic slowdown will weigh heavily on the retail and construction sectors. While GDP is forecast to slow in the short term, the medium- to long-term prospects are still strong for Mexico thanks to improving fundamentals and effective policymaking. Mexico’s economy has been performing sluggishly, well before the November 2016 US presidential elections. GDP grew only 2.3% in 2016, mainly due to decreased oil prices, lower oil production, tighter fiscal policies and low productivity growth. Ongoing domestic political woes – namely the unstable security situation and widespread corruption – continue to negatively affect business and consumer sentiment. On top of this, uncertainty over future US policies has added to Mexico’s challenges. GDP growth is forecast to slow further this year to 1.5%. Mexico’s economy is highly dependent on the United States. The direct channels through which the Mexican economy could be affected by US policy are: trade and investments, and to a lesser extent remittances and immigration. Mexico is also indirectly vulnerable to the broader global effects of President Trump’s policies. This vulnerability is reflected in higher peso volatility and declining confidence since the election of Donald Trump. Protectionist rhetoric from Washington has specifically targeted Mexico and diplomatic relations have been on a rollercoaster. Uncertainty surrounding trade policy in particular – both what will be implemented and what would be feasible outside the bounds of WTO dispute resolution mechanisms – has become a central concern for Mexico’s outlook. Since January, however, fears have largely eased as the US administration appears to be taking a more traditional and pragmatic approach to trade policy. Business and consumer confidence have been improving since February and March respectively. That said, uncertainty still clouds the Mexican economy’s outlook. Exports directed to the US accounted for over 80% of total exports and 26% of GDP in 2015. As a result, Mexico’s economy is exposed to developments in the US, which has been most evident in heightened exchange rate volatility since mid-2016 as the US elections heated up and protectionist rhetoric increased. Responding to these fears, the peso depreciated 15% against the USD between the election of Trump and his inauguration in January. 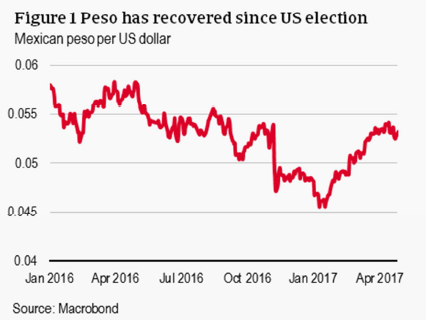 However, since the inauguration, the peso has recovered – being the strongest performing currency thus far in 2017. Since Mr Trump has taken office, his stance on Mexico has largely moderated. Highly-integrated supply chains between the US and Mexico mean that some large US companies would also be negatively affected, dissuading the administration from imposing penalising tariffs. Free-trade ideology also remains a focus of the Republican Party which has kept policymaking tempered. Mr Trump has also demonstrated that he is willing to sacrifice campaign promises to get policy through Congress – as demonstrated by the recent passing of the budget without financing earmarked for a US-Mexico border wall. We expect the more orthodox policy to be maintained, but uncertainty remains. While exchange rate fluctuations act as a shock absorber, the depreciation has pushed up consumer prices. Despite recent appreciation, inflation is expected to stay above the 4% target this year due to higher petrol prices and base effects. In order to protect the currency and prevent additional inflationary pressures, the Bank of Mexico has increased the benchmark interest rate several times – from 4.25% in July 2016 to 6.50% in late March 2017. This monetary tightening negatively impacts domestic demand further. Thanks in part to exchange rate depreciation, Mexican exports become less expensive in US dollar terms. In March, exports increased 14.1% year-on-year, the fifth straight month of annual gains. However, not all of this benefit is passed on to Mexican firms since a large share of their manufacturing exports have US import content, which is comparably more expensive. 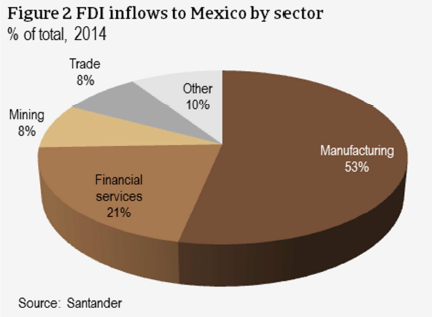 Mexico benefits from significant foreign investment (FDI), which accounts for 44.3% of GDP, with over 40% of all inflows coming from the United States. Over the past ten years nearly half of all FDI has gone to manufacturing – the sector most dependent on NAFTA-integrated supply chains. Uncertainty over the renegotiation and even the possible scrapping of NAFTA will undoubtedly slash investment in manufacturing. While FDI in the Mexican mining sector is expected to increase alongside recovering prices in 2017, this would only partly compensate for lower manufacturing investment. Portfolio investments in Mexico are also very high – totalling a whopping 268% of its international reserves in 2016. This makes Mexico vulnerable to shifts in market sentiment due to the short-term nature of this kind of investment, as it could be pulled out as soon as sentiment sours (as opposed to direct investment, which is longer term in assets factories). However, this high stock of portfolio inflows also represents the high level of development of the Mexican financial market. In the medium-term, we expect FDI inflows, even in the manufacturing sector, to continue strongly. Mexico’s maquiladora industry for instance is the manufacturing house for the US. Possible US import tariffs could cause some manufacturers, especially in the automotive and electronics sectors, to shutter their doors. But many US firms manufacturing in Mexico are exporting to other non-US countries, so are not likely to be hampered by US border taxes. As such, the competitive advantage of locating manufacturing in Mexico could be broadly maintained, and medium- to long-term investment would continue. Remittances from Mexican workers in the US amount to about USD 25 billion annually – the largest amount in the world. While impediments to these transfers, such as a potential US tax, would decrease the net value of remittances, hurting consumer confidence and private consumption. The effect on the total economy however would however be limited, as remittances account for just 2.2% of Mexican GDP. Furthermore, peso weakening has significantly increased the value of remittances, earnings in USD, in local currency terms. A mass deportation of undocumented Mexicans from the US would increase Mexican unemployment while also decreasing the level of remittances. The increase in the untrained workforce in Mexico would also come at a time of slower economic growth which already would lower the availability of jobs. Businesses active in the public construction segment are strained due to fiscal austerity, which began well before the Trump presidency. Curbed public spending has led to the postponement of several infrastructure projects, such as power plants and airports, and less investment in the energy sector, despite the recent energy reform. This tendency would accelerate in the case of a steeper economic downturn, driving up already-high payment delays. While residential construction has fared better so far, it has been affected by lower consumer confidence and increased interest rates. Construction business margins have also been affected by the end-2016 peso depreciation end of 2016, which made the imports of raw materials and machines more expensive. After the US presidential election Mexican consumer confidence deteriorated sharply, especially in the Northern region where the maquiladoras – the factories that import raw materials duty-free from the US and export finished products – are based. While consumer confidence has rebounded somewhat since February 2017, higher inflation and rising interest rates still negatively affect consumer spending and subsequently retail. The scrapping of fuel subsidies since the beginning of 2017, as well as increasing global fuel prices leaves many households with less to spend on consumer durables. In 2016, the tourism sector enjoyed 8.9% higher arrivals and 10.4% higher earnings. Depreciation of the peso has made Mexico a more attractive destination. American visitors account for nearly 60% of all air arrivals and most border crossings. A robust outlook for US GDP growth suggests that the tourism sector should benefit from another strong performance in 2017 and 2018. This however is only as long as security does not become a serious issue in the Yucatan peninsula and Baja California, the main destinations for American tourists. Decreasing construction activity directly affects the metals and steel sector, which is already suffering from overcapacity and subdued production. Options for increased exports remain limited due to the current overcapacities in the global steel market. Since 2014 the Mexican oil and gas sector has been suffering from low global prices, coupled with shrinking production capacities. That said, the passing of a comprehensive energy reform has finally paved the way for highly-needed foreign investment in the industry. While ongoing uncertainty could shy away foreign businesses from entering the related bidding processes for future exploration of deep water fields, investment in the sector appears to be holding up. On 5 December 2016 an oil field auction was highly successful with eight out of 10 blocks being sold to a broad range of large oil companies, including France’s Total, Norway’s Statoil, UK-based BP, and US-based companies Chevron and Exxon Mobil. A USD 11 billion contract has also been signed in March between Pemex and BHP Billiton, sustaining the resilience of this sector. Due to its proximity, the very close economic ties and its dependence on the US market, Mexico stands to lose more than most other countries from radical shifts in US foreign and trade policies. The softening stance of the US administration toward Mexico ahead of NAFTA negotiations has eased concerns of financial de-stabilisation and/or a recession for the time being. The short-term outlook for Mexico’s economy is still weak and remains highly vulnerable to US policy shifts, but a steep deterioration now represents a downside risk as opposed to a baseline scenario. The country is well-placed to deal with uncertainty, while supply chain integration with the US and close integration with major global economies serve as a buffer. This should help secure robust growth in Mexico in the medium- to long-term. A well-developed financial sector and competitive advantages for manufacturing on non-US export markets should keep foreign investment up in the medium- to long-term. Commodity prices are recovering, and the Mexican resources sector is obviously a very attractive investment destination for international firms. In the medium term we also expect trade dependence on the US to ease as Mexico has renewed its focus on strengthening ties with the Pacific Alliance, Mercosur, and the EU, on top of the 12 other free trade agreements it has in place with 46 countries. 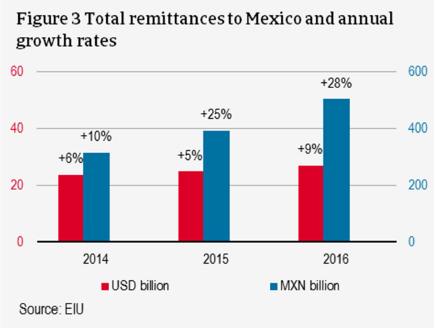 Compared to other emerging markets, Mexico is also more resilient against the fallout of President Trump´s expansionist economic policies – namely higher US interest rates and the associated capital outflows. Monetary policy has been used effectively so far, and a new currency hedging programme means that the Bank of Mexico does not need to lift interest rates further in order to reduce pressure on the peso. This shows that Mexican policymaking is robust and should relieve some pressure from consumers and businesses alike. Therefore our outlook for the Mexican economy is one of slowing growth, largely driven by policy uncertainty in the US. As a result, payment delays and insolvencies will increase in 2017. But in our baseline scenario, we do not expect the “Trump effect” to be overly destabilising. Thanks to effective measures to reduce external vulnerability and diversify trade partners, GDP growth is expected to pick up in the medium term driven by a recovery in investment. US leaves TPP-dashed hopes for industry growth in Asia? The US decision to leave the TPP agreement could foretell profound economic and strategic implications for certain Asia Pacific economies and industries. The consequences of any US shift on its Mexico policy remain to be seen, but increased currency volatility has already an negative impact on the economy.